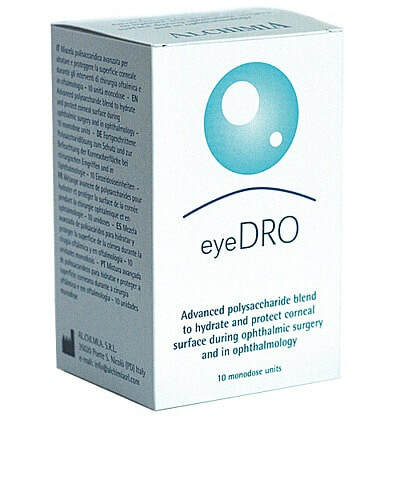 eyeDRO is an advanced polysaccharide blend for a stable and long-lasting hydration of the corneal surface and effective protection of the corneal epithelium during ophthalmic surgery. Replaces the requirement for BSS applications during cataract surgery, and provides optical clarity and magnification up to 15% of the underlying structures. Used during vitreoretinal surgery, eyeDRO replaces the need for BSS, and provides a stable support to contact vitrectomy lenses during membrane peels. eyeDRO is easily washed off with saline solutions.